It's been all quiet on the blogging front the past few weeks. Life gets like that sometimes. I am easily overwhelmed by the endless tasks, plans and responsibilities of life, and blogging is often the thing that takes a back seat. I'm ok with that. I hope you are too. The last few weeks have been particularly busy. We started last week with a funeral, ended it with a christening and sandwiched a massive three-day church conference in the middle. I've then needed a week to process, reflect, recover and to get up and go again. But my heart is full. My heart is full, knowing that God, in all His glory, chose to sacrifice His Son so that I could have a relationship with Him. My heart is full because I know how woefully inadequate, unworthy and insignificant I am. I know what I'm like. I know that I am so far from perfection. I know that I am a total work in progress, sometimes a wreck, and yet God knows me better than I know myself and still chose to make a way for me to have a relationship with Him. My heart is full knowing all of that, because not only did He want a relationship with me, but He also decided to call me, equip me and gift me so that He might use me for His purposes. My heart is full because 10 years ago He planted me in a church that had more vision than I could ever have for myself. A church that encouraged me to live a full and expansive life, a life worthy of His sacrifice. A church that taught me to reach for the moon, dream big and trust God for the impossible. My heart is full because despite my failings God wove my life into His plan so that I might participate in a purpose beyond my wildest imaginations. My heart is full because I live in a day where 10,000 people can fill the O2 Arena for three days and lift the name of Jesus over London, over Europe. That as a result, the eternal destiny of many individuals, families, churches and nations are changed. My heart is full because we are now living in days and seeing things come to pass that 10 years ago we only dreamed of and believed to be impossible. My heart is full because even though we are no longer a part of this particular church, we carry its legacy wherever we go. Our lives are changed, and the lives of other people are changed because of the investment of many wise, visionary and amazing people who have gone before us. My heart is full because those wise and visionary people knew me as an awkward, shy and lost 19 year old and still saw something in me that was worth investing in. My heart is full because many of those people are still investing in us today - their legacy is in us as our legacy will be in future generations. My heart is full because despite suffering losses, God has blessed us beyond our wildest dreams. I would have been happy with any child, and yet God saw our loss and entrusted us with a child who is the embodiment of His blessing. My heart is full knowing that my children will be raised to believe for the impossible, and it will come to pass. My heart is full because I'm only now seeing the impact of our own lives over people that we have had the privilege of leading over the years - to see their lives move forward has been one of my greatest joys. 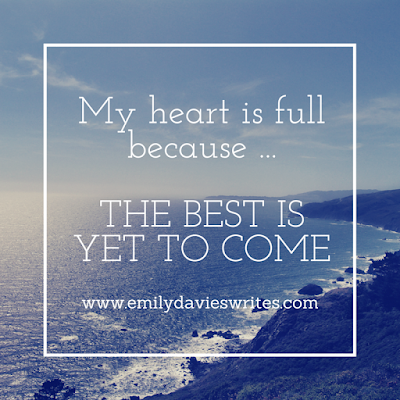 My heart is full because God continues to have a plan and a purpose for my life, one to give me a hope and a future. I am only scratching the surface when I think of what has been before and try to imagine what is in our future. 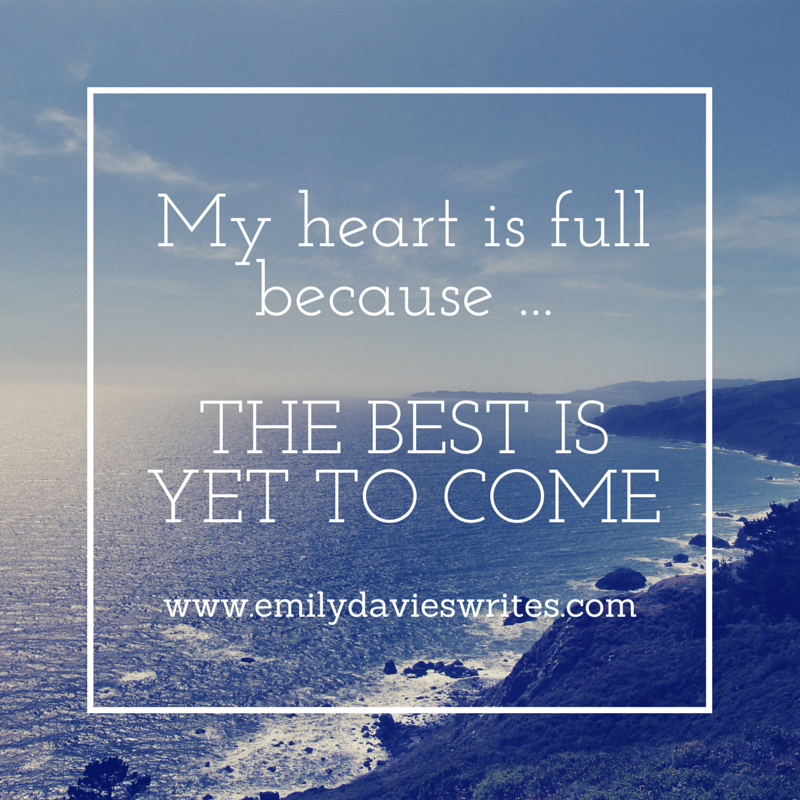 My heart is full because the best is yet to come.